Ingredients for making Fish Tagine Tagine is a cooking style from North Africa, and also the name of a cooking pot (a bit like casserole). 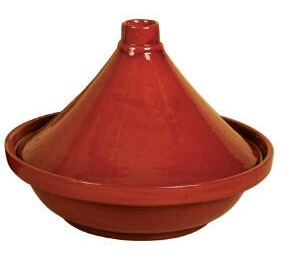 The pot has a circular base and a conical lid. You can use a conventional casserole dish as an alternative. Tagine dishes are usually based on meats such as lamb, which are very tasty, but this version uses boneless fish fillets, which are spectacularly good. Any firm-fleshed white fish will be fine; I have tried both cod and haddock, which work well. Grate the rind from a lemon (wash it first!) into the blender - keep the rest of the lemon for later. Whizz the whole lot for a few moment, then add a tablespoon of vegetable oil, then whizz again. Wash the fish, then cut into pieces about an inch on a side. 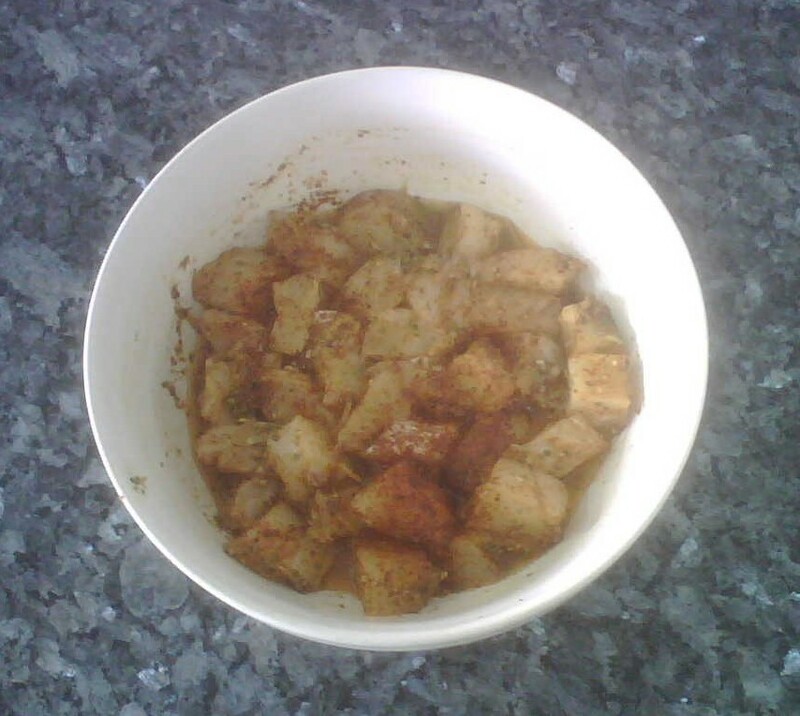 Put the chunks of fish in a bowl, add the marinade, mix gently (use your fingers! ), then cover the bowl with cling film and stick in the fridge for an hour (or overnight). Meanwhile, prepare the vegetables. Roughly slice a large onion (red onions works well in this recipe, although you may need two smaller ones) and put in a small frying pan with a tablespoon of olive oil. Cook this very slowly and gently for 10 minutes or so. The idea is to get the onion nice and soft, but not browned in any way. Wash the aubergine (also known as Eggplant) and chop into pieces about an inch on a side. Put two tablespoons of cheap olive oil in a large non-stick saucepan and add the aubergine pieces. Cook gently for about 10 minutes, sitring occasionally - the aubergine should be slightly browned on all sides. Wash the courgettes and hack into lumps about an inch on a side. (You'll have realised by now that the idea is to get the fish and vegetable pieces all about the same size!) Toss into the same saucepan as the aubergine and cook for another two or three minutes. Retrieve the fish from the fridge. Scoop out the fish pieces and place in the tagine (or casserole) dish. Any remaining marinade can be added to the onions in the frying pan and cooked for a couple of minutes, stirring all the time. Add the aubergine and courgettes to the tagine, and then the onions. Squeeze the lemon and add the juice to the tagine. Dissolve a fish stock cube in a quarter of a pint of boiling water from the kettle, and add this to the tagine. Also add a tin of chopped tomatoes. Top with some freshly-ground black pepper. You probably won't need salt, since stock cubes are often quite salty. Stir gently, trying not to break up either fish or vegetables. Put the tagine in a pre-heated oven at gas mark 5 (180C) for about 45 minutes. The fish and vegetables should be cooked through and soft, but not broken into pieces. Serve straight from the cooking pot at the table. I like to serve this with cous cous (just follow the instructions on the packet!) and Morrocan-style flat-breads (pitta bread makes a good alternative).